During our one day layover at Compass Cay we made sure to hit all the sights we possibly could (and yes, that was ALL of them). After we’d kayaked through the island, we paused for a brief lunch aboard Rode Trip before heading out into the water. 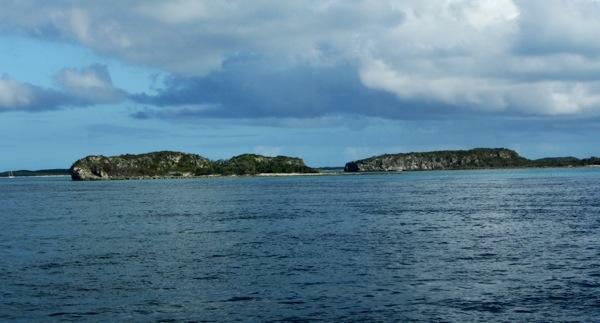 Near Compass Cay are a cluster of islands called Rocky Dundas. 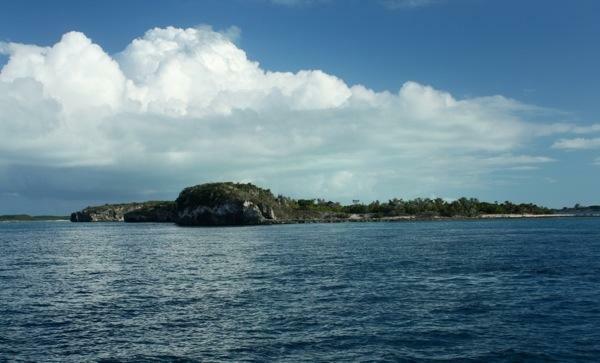 These islands actually lie within the borders of the Exuma Land and Sea Park. The park maintains two dinghy moorings that you can use while exploring. The lure of the Rocky Dundas…caves! Here is our view of the islands when we passed by as we approached our anchorage. 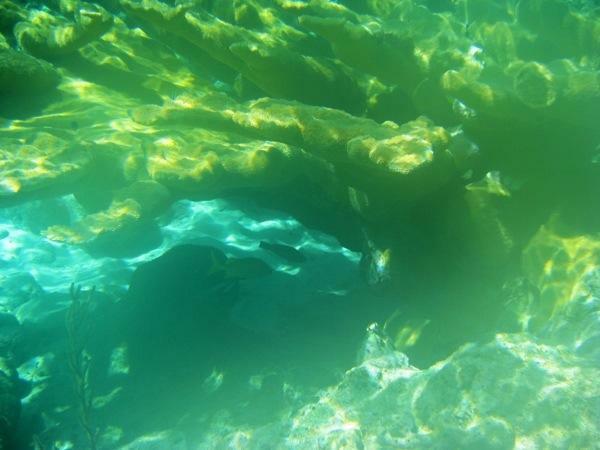 At low tide you can snorkel into the caves at the base of the rocks. Now, this was my first time snorkeling in the Bahamas and I was thankful to Bob and Susan having helped me to find the perfect mask and snorkel set. I was also thankful to Kim for having a wet suit that kept me warm and helped me float. I’ll be honest, I’m still getting used to the flippers (aka swim fins). I did actually take them off…but that’s another story. Once suited up, Brian patiently guided me from the dinghy (to which I was clinging) into the cave a mere 15-yards away. He did a nice job of scattering the fish away too. 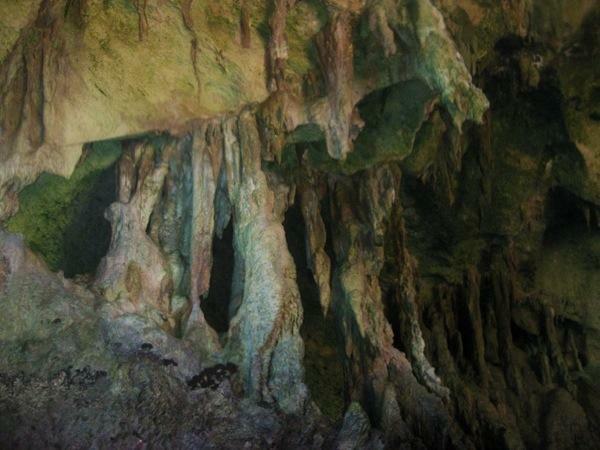 The cave was worth the swim. Still getting used to those flippers (aka swim fins), I stayed near the dinghy while Brian took a look around via snorkel. 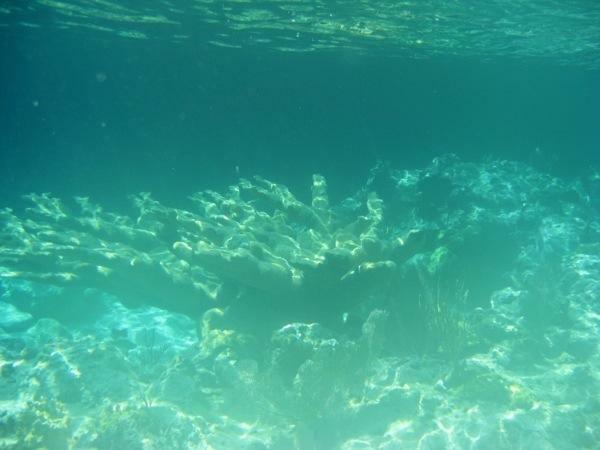 Then we took the dinghy to another, larger reef which was nearby in the Exuma Land and Sea Park and known for having pillar coral. I was content to lie over the side of the dinghy and stick my masked, snorkeled face into the water for about two-minutes. Brian swam around for a bit taking in the underwater sights. We both decided this would be more entertaining if I could read and Brian could hunt. After all, we did need something for supper. So we exited the park boundaries, made a quick stop at Rode Trip, and took the dinghy over to a reef just off Compass Cay. Success! I nearly finished a chapter in The Path Between the Seas the Creation of the Panama Canal 1870-1914 by David McCullough (after months it’s nearly finished!) 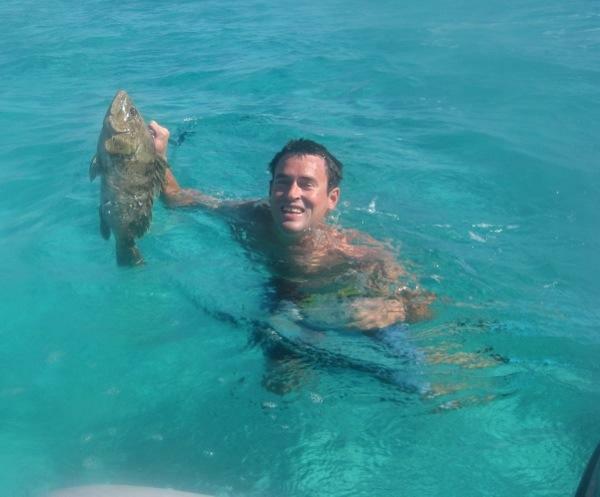 Oh, and Brian killed his first ever speared fish. Hooray! 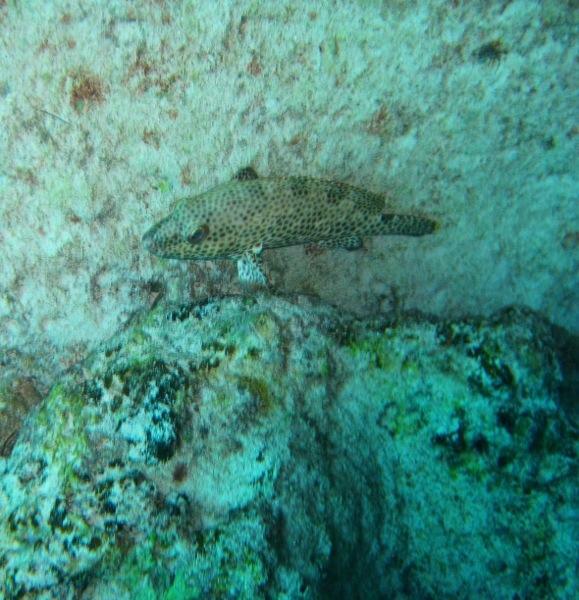 Grouper is on our menu tonight. 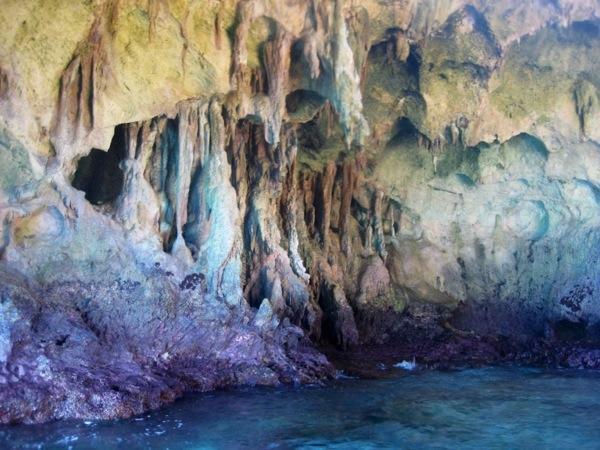 This entry was posted in Uncategorized and tagged caves, Compass Cay, Rocky Dundas, snorkeling by stephanie. Bookmark the permalink. Wish we could send you some fresh fish, Brian’s becoming a master at hunter/gathering.